After watching his video 4 more times, I think you are correct. It does appear that he re-routed the feed motor wires to the secondary of the second transformer. Since he apparently spliced into the trigger relay on the motherboard and connected that lead to one of the primary leads on the second transformer, it looks like he spliced into the the blue fan wire (its blue in my HF) on hot side of the switch and connected that to the other lead on the primary side of the second transformer. So assuming the trigger relay is the AC neutral and the fan wire splice is the AC hot side, then that all makes sense now. I believe there is a newer version and an older version of the welder in the different videos. I never changed anything to do with the small transformer. I only added the rectifier, the choke, and the resisters to the transformer outputs to change them from ac to dc. I would be tempted to put the motor on a separate circuit using the second transformer. The trick would be finding a way to tap the trigger relay input signal with a second wire to another relay that controls the new circuit. It might be to tricky to do and it might have been his original intent. Brian,great job on the welder will do mine also now, by the way the bridge rectifier (MDS150A 3-Phase Diode Bridge Rectifier 150A Amp 1600V) is in fact a full wave rectifier.To get half wave rectification you use only one diode from ac, this is not the case here,where two diodes are used for each phase. Harbor Freight seems a good brand for welding machines. Check into used Lincoln, Miller, Hobart, ESAB machines. Check less expensive but well supported machine brands like Lotos, Eastwood, Everlast, USAWeld (HTP) and some others turning up the heat on the main-stream brands. Always check the internet for reviews before buying, wisdom comes with many opinions averaged out! With the mods, you are essentially upgrading it. I got an old well-used mig century model, for what I could have gotten a HF model for, but I looked for about a year for it and it leaks some gas, but I don’t use it often enough to justify buying a new gun/hose kit for it. I have 125 amp Harbor Freight Flux Core welder. I bought it for $89. Weld was splattery (like dog’s slobber) and sucky. I decide to check out Welder mods. I found your site as well as other. I ordered 150amp Full Bridge Rectifier and 68000uf 63v Big Can Capacitor. Bought couple foot of black and red 6 guage wires, connector ect… I put it all together and made it neat and organize. I use old Pentuim III heatsink (4 inches silver heat sink with tiny cooling fan removed) and put thermal paste on its back, I drilled hole and bolted it to Full Bridge Rectifier. I trimmed Secondary Transformer wire that it will hold Rectifier without any contact around the welder case and cooling fin facing toward to welder cooling fan. Capacitor laid on bottom of welder and hooked up 6 gauges wires (red and black) according to its polarity to Capacitor and from there I hooked Electrode to Negative and Clamp to Positive. I haven’t add resistor to drain Capacitor yet but will do that soon. I tested welded the scrap using cursive “e” and setting #4 speed and Min setting. Weld on scrap look so beautiful, enough to make me cry. No splatter!! Soon, I will order Toroid cores and 6 Guage enameled wire to wrap around. I did not need to unsolder anything, just unscrew capacitor and re connect to Toroid and then I’m ready to weld. I will post Picture of my “design”. So it works perfect for the first time I’ve put together. (Of Course I’m electronic Technician myself). I have been struggling over the past year with power sources for my welding projects. I have a new-in-the-box buzz box 240 volt AC/DC stick welder and I made an extension cord to plug it into a range outlet, but I never had the opportunity to do so yet. I tried running my HFT flux core machine off of my 1500 watt inverter, but the inverter refuses to power it. So I ran an extension cord to my neighbor’s house while I wait for my 5000 watt 240 volt inverter. But yesterday I was welding away on a stool for my gasifier and my flux core machine started buzzing loudly and lost a lot of power. It is unusable as-is. 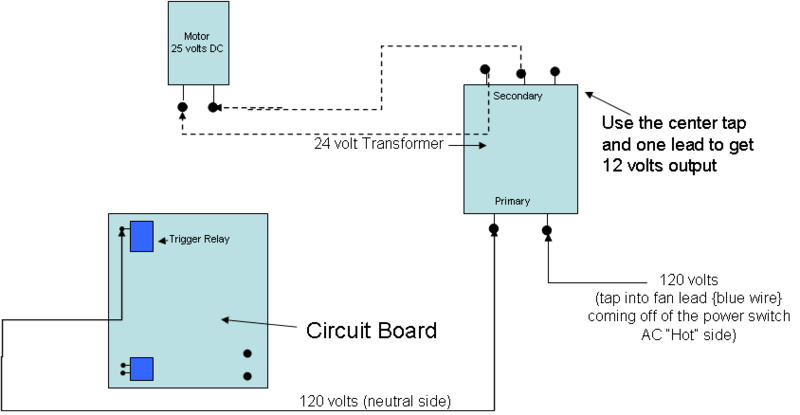 Upon examination there is either a short in the transformer windings or a bad connection at the spade connectors. So I used my deep cycle batteries to stick weld finish my stool. But I was left without a machine for welding thin sheet metal. Today I wired four solar panels in parallel directly to the high current output of my wire feed machine before the inductor and disconnected the transformer. I was able to heat up and melt the wire, but I only had around 16 amps at 32 volts coming from the panels. I had a social function to attend so I didn’t connect more panels, but I did get a load center today and 10 circuit breakers to connect 10 to 15 panels together. After today’s proof of concept I am confident I will be welding wire feed powered by the sun tomorrow. Here is my solar powered welder. I have 11 panels connected to a load center through 9 circuit breakers. If I want to add power I can turn on another breaker. If I need less power I can flip a switch and remove panels. Here is a close-up of the guts of my welder. The two big wires on the left are positive and negative from the load center. Positive connects to the (lower) positive post of the capacitor and goes on to the ground clamp. Negative goes to the inductor through the other side and then connects to the negative post of the capacitor and on up the cables to the gun. The two wires from the secondary coil of the transformer are detached and taped off. I also removed the resistors that I had to drain the capacitor. I am now back to a hot tip gun, but I think that helps to kick start the arc. Here is my first weld on my solar powered welder. They are water heater wire box covers. It works better on days with full sun. When it’s cloudy like today the power output from the solar panels can be erratic, but I will make do. My solar panels are well-suited to power a wire feed welder because they are 235 watt panels that produce a steady 30 volts no matter how much sun is shining. 30 volts is about perfect for this kind of welding. Each one puts out a maximum of 8 amps or so. Therefore I can add a bit more power 8 amps at a time by flicking a switch. I feel like I have more control over the power level now than just to select min or max. What you are doing is interesting! Myself, I would put more battery and / or capacitors into the final stage of the system to store some electrons and average the load to the solar panels. If your panels get damaged, that’s a pretty expensive welder. Also, I think you should try out that N.I.B. “Buzz-box” welder, even if you have to take it to the 220vac source. You might like what that stick welder can do for you. Good day, Mike. Thanks for the comments. How much more than 68,000 microfarads do you suggest? Plus I have the inductor which is a magnetic “battery.” It works pretty well for me. I feel like if I can’t use my solar panels for what I need them for, then I might as well toss them into a landfill right now. I won’t be afraid. I really don’t believe they are so sensitive that they can’t handle short circuit welding. Time will certainly tell. I do have a battery powered stick welder, and that is way too strong for welding sheet metal. It is hard to weld 1/16 and 1/8 inch steel with it. It pushes well over 100 amps. So anything under 100 amps I can use solar and anything over 100 amps I can use my batteries. I have a 225 amp hour 30 or 36 or 42 or 48 volt battery for welding heavy metal. It works great on the thick stuff. Ultimately I have a 5000 watt inverter that will produce 20 amps at 240 volts coming from Taiwan in the next couple weeks and two of those babies will power my buzz box no problem. So I will get to try it out soon! I should also mention that a friend of a friend wired some of his solar panels directly to a water heater element to heat water for bathing with solar. That is a resistor which is close to a dead short. Welding is similar; the wire acts as a resistor to create heat and melt the metal. I should be fine. However, you are absolutely correct: if short circuit welding damages either my solar panels or my batteries, then it is a very expensive set of welds, indeed. I am actually more concerned about the batteries. They are rated at 225 amp hours, but that is a 20 hour rating, meaning that you could draw 11.25 amps for 20 hours and they would be completely dead. Doing so would damage them, though, so a rule of thumb is to never discharge them below 50% capacity. Maybe draw 11.25 amps for 10 hours. But I am drawing 120 or 140 amps, and such a huge draw is very hard on them and reduces the overall life of the battery. But I need to stick weld right now, so do I use them, or not? What do I even have them for if I can’t use them? I try not to weld very much and then fully charge them the next day. Solar powered stick welding. Something else.